“Hoove, hiffe de splath!” shouted a voice from a hedge, struggling to make himself heard over the noise of the lawnmower. “Sorry?” I attempted to politely shout in a volume that would be loud enough to make the intent of my reply without actually giving me a sore throat. It clearly worked as the lawnmower suddenly stopped and a grey haired man slowly popped out from behind the swathes of greenery. “You’ve missed the path!” he repeated, this time a tad more understandable. “Oh. I just followed the sign,” I replied, a tad confused given I’d simply followed the direction of the fingerpost at the entrance to the field. To be honest, I had wondered why the North Downs Way had seen fit to lead me through a large clump of nettles. Clearly I wasn’t the only one who ended up trudging through the undergrowth near this fellow’s immaculately trimmed lawn as there was a very faint path. But there, twenty metres or so away, blindingly obvious for all to see, sat a nice, wide, clear path. One with no bumps, no elder and certainly no nettles. I gave my thanks to the mower of the law and decided that life would be much easier if I did what the locals did. Unfortunately the only way to join the locals path was to trample right through the middle of an even more ferocious set of nettles. Legs red raw from nettle stings, I headed to the stile, tripped over a rabbit hole and decided I simply had to get out of that field just as quickly as possible. “We have all the time in the world,” proclaimed Louis Armstrong in his famous song. And it’s a lovely notion but fails to take in to account that we don’t have all the time in the world. There’s that thing called work which tends to get in the way for starters. And shopping for groceries too. And all the other stuff. Helping people move house, painting skirting boards, doing the gardening, and Aunt Bridget and Uncle Harry’s 50th wedding anniversary. Yeah, Louis. You may have all the time in the world but sadly I don’t. Which was why it had been five months since I’d last walked a section of the North Downs Way. However a sunny Saturday in May was enough to entice me out and return to Wye for another day’s walking. But first I had to retrace some steps. 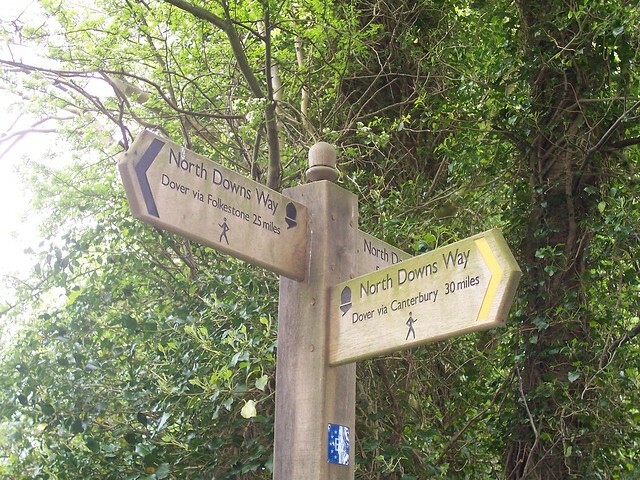 In the months I’d been away, I’d pondered which of the North Downs Way’s two options for getting to Dover that I would walk. Would I take the longer northern route via Canterbury, following in the footsteps of pilgrims who made their way to this most famous of cathedral cities? Or would I head south for a journey along the coastline, near the Eurotunnel and the relics of defences built for World War II? And walk five less miles whilst at it. I’d made and changed my mind so many times it was unbelievable. But in the end, the decision was made for me. With no easily accessible train station between Wye and Dover, the southern route would require a whole weekend to do the walk in. In contrast, I could split the northern one quite easily at Canterbury. And as I only had one day to spare on this trip, the decision was pretty much made. Northern route via Canterbury it would be. The smell of strawberries wafted gently out of some polytunnels as I walked up through the farm towards Boughton. They don’t call Kent the Garden of England for nothing and the local orchards were filled with apple blossom for good measure. Then, before I knew it, I was back on the quiet, rural lane standing at the signpost that marked the dividing point of the route. Canterbury was now just a mere 13 miles away. A gentle track led me on, up to the village of Boughton Aluph, named no doubt after the local lord of the Major, Aluph de Boughton. “Village” seemed a bit over the top for what basically amounted to a few buildings and a deserted church. The church had a sign outside, telling any prospective worshipers that they needed to head down to Boughton Lees instead; those wishing to praise God in the Aluph church would have to wait until this silent building reopened in the summer months. 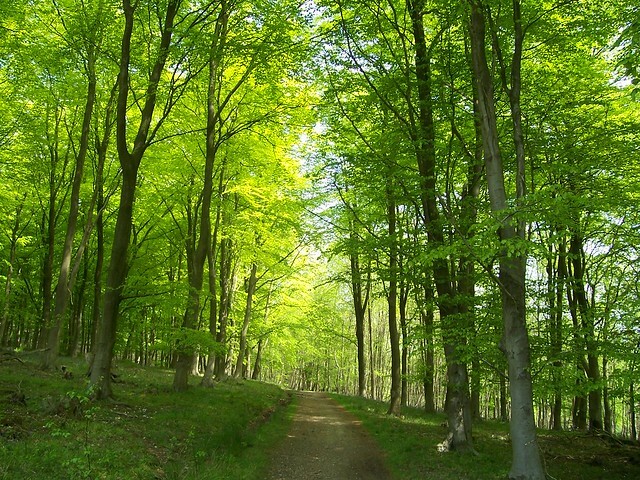 Soakham Farm and the endearingly name Soakham Downs followed before the North Downs Way plunged in to one of its famous woodland sections, for several miles of walking through a group of trees known as Kings Wood. 1,500 acres of trees; Kent’s largest woodland, full of chestnuts, beech, pine and fir, and a forest floor full to the brim of bluebells and violets. Often woodland walking can be a bit dull, but Kings Wood was full of the kind of enchanting paths that are just a delight to stroll down, with a skip and a jump and a hey-diddy-hey. As the sun streamed through the leaves of the trees, the woodland was bathed in a beautiful green glow. 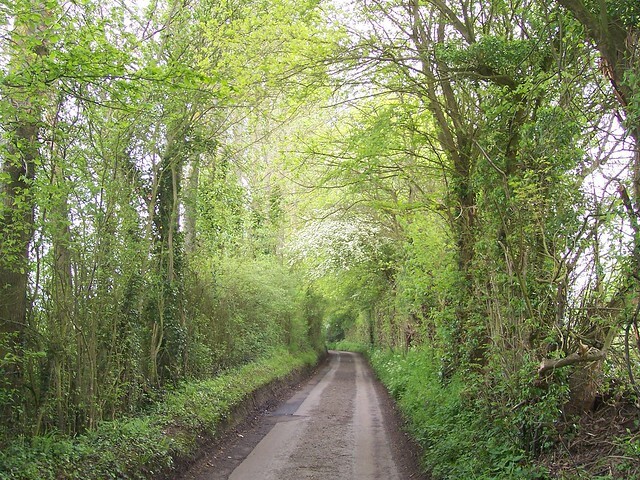 After the woods, a lane named Mountain Street took me towards the village of Chilham, with the grand Chilham Castle manor house sitting off to the side, hidden away by a metal fence. Parts of the manor house date back to the Norman era, with the most dominant buildings having been built in the 17th century. For much of 20th century it was owned by the fantastically named Conservative politician, John Clotworthy Talbot Foster Whyte-Melville Skeffington, who was the 13th Viscount Massereene and the 6th Viscount Ferrard. After his death in 1992 the manor passed to his widow, before eventually being sold in 1997. Another politician now resides there, namely UKIP treasurer Stuart Wheeler. The gardens are occasionally open to the public, but through a gap in the railings there was a cracking view with the castle in the background. Thanks to the castle, some 18th century houses and tea-room, Chilham was busy; the centre of the village sadly filled up with the parked cars of those bringing in the tourist pound. Having found nowhere else to really eat lunch, I put myself down on a nearby bench and watched as a group of bikers parked up and popped in to the tea-room; perhaps for one of its apparently famous Kent Cream Teas. Which are, presumably, merely a cream tea served in Kent. A man stood with a camera on a tripod, standing so still that it was as if he was a statue, before swiftly packing up and zooming off in his car. Despite the number of people, and the number of cars, the whole place seemed to exude calm, peace and serenity. Lots was happening but in a quiet way. There didn’t seem to be enough locally to keep them occupied, even if the castle gardens were open. They couldn’t all have come to seek Thomas Beckett’s grave in St Mary’s Church, could they? If they had, they may not find it. No one’s quite sure if it is there after all, and given he died in the 12th century, we’ll never know for sure. Rising from my bench, the North Downs Way took me past the church; a church that managed to look large yet squat at the same time. 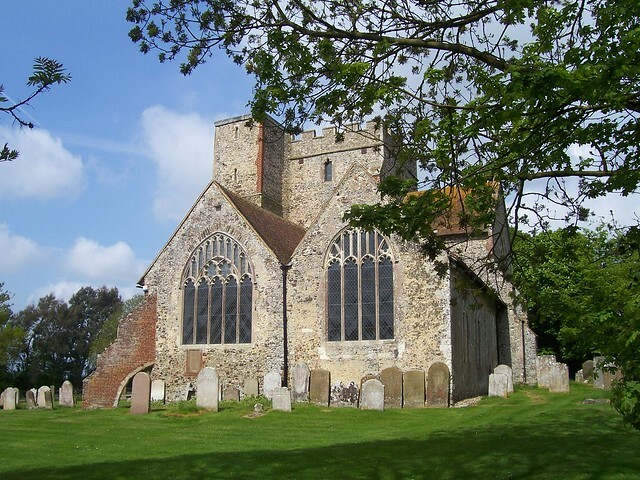 St Mary’s was mentioned in the Doomsday Book, and some of the current building dates back to the 13th century. In contrast the church tower’s clock only arrived in 1727, although residents had to wait until 1790 before it finally got given a minute hand. But then, what do you need to know anything other than the hour for, anyway? A lane led me through Old Wives Lees. It had originally been Oldwood Lees, named after John Oldwood who owned the manor house in the local area in the 15th century, although how it became Old Wives is lost in the mists of time. Then the North Downs Way headed in to agricultural land; well I was in the Garden of England. Apple trees grew in strict, regimented lanes for easy picking and one website I read later told me that I’d traversed the largest fruit farm in Britain. So big was it that it seemed to contain its own village. Several rows of green static caravans stood on a hillside, presumably home for the many seasonal workers who came to work on the farms at harvest time. I once read an article about rural jobs in East Anglia, with one resident complaining about “all these foreigners, taking our jobs. Something should be done.” Yet further down the same piece, the farmer who had employed the foreign workers was blunt and straight to the point. “None of the locals want our seasonal jobs,” was his response. He simply couldn’t fill the roles as the locals wanted year round work which he couldn’t provide. If he didn’t hire people from Eastern Europe, who were willing to do the job, his harvest would be rotting in the fields. There was another orchard further on at the village of Chartham Hatch. No Man’s Orchard is a different kettle of fish however. It is home to about 200 trees, but they’re certainly not small, regimented or ordered like a commercial farm. That’s because No Man’s Orchard is one of the few remaining traditional orchards, bought by local councils in the 1990s to protect it and to act as a nature reserve. The curious name? Simply that the orchard once straddled two areas of ownership, and thus was not owned by one man. 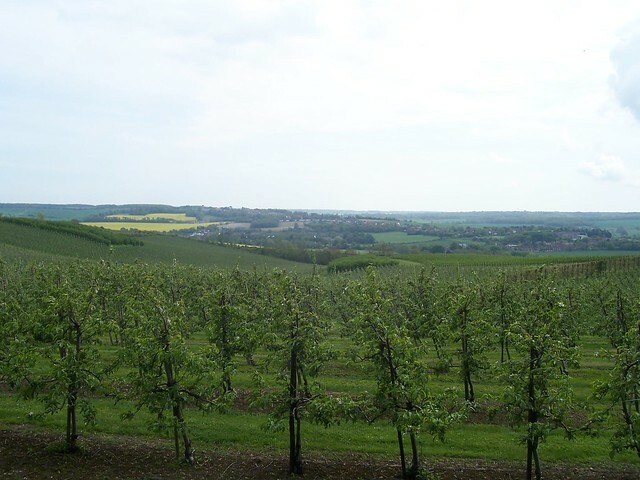 The orchard’s ten acres sat close to the A2, which also provided a boundary to the sprawling city of Canterbury. Soon as I was walking through its streets as the North Downs Way led to me to towards the city centre. Then all of a sudden I was stood near Canterbury West station, home to that would whisk me back to central London. I stood for a moment, idly pondering whether to visit the city’s famous cathedral, but after fifteen or so miles I was hit by a sudden weariness. Canterbury would still be here next time. I bought my ticket and headed back home. Next time: hi-ho, hi-ho, it’s off to Dover I go. I have just reached Dover via the Southern Loop and have more or less followed the suggestions from this site but for anyone interested in backpacking from Cuxton onwards I stopped overnight at Coldblow Farm (beyond Detling). Dunn Street Farm (Nr. 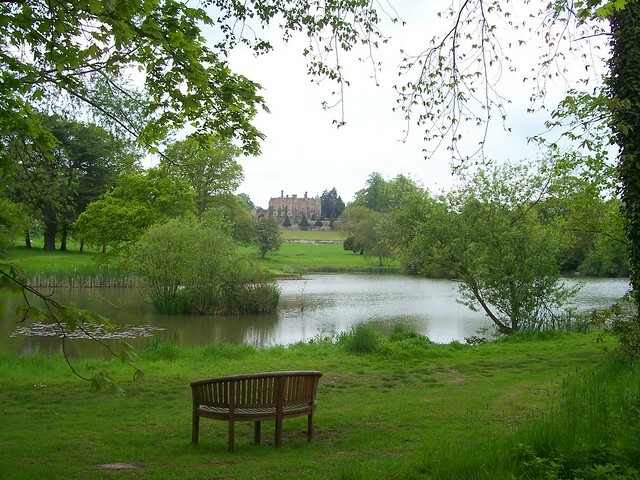 Westwell) and The Lodge (Lymbridge Green – a bit off the path). I made a further stop at the Warren, Folkstone to avoid a promised rail strike before going on to Dover. I hope that’s of use to someone. Thanks for a very helpful site. First Published: 18 February 2013. Last Updated: 16 November 2014.